Are you experiencing serious back pain or other symptoms from an injury? See what problems we can fix by tapping the links. 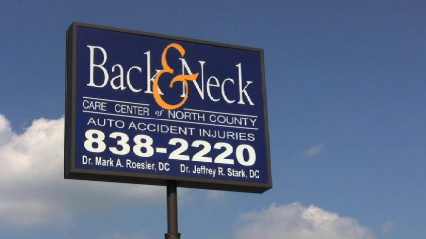 Expert, practical care is available at the Back & Neck Care Center of North County in Florissant, Missouri. Whether you've been a recent victim of an automobile accident, sports injury, or you are part of a family with a history of back and neck-related problems or sciatic pain, our highly trained staff are ready to help in any way they can. Treatment of your pain requires the competence and flexibility of our knowledgeable chiropractors. We provide our patients with an enormous array of relevant skills conducted within a safe, clean environment. With our modern facilities and our boundless expertise working for you, there are countless obstacles we can overcome together with our chiropractic experience. WE ACCEPT MOST INSURANCE. CALL OR EMAIL FOR A FREE CONSULTATION! Dr. Jeffrey R. Stark, D.C. provides expert, practical care. From the moment you walk in the door to the moment you are able to function without pain, you will experience a sense of relief from your visits to our offices. After all, we would like you, as our valued patient, to be as satisfied as possible with our chiropractic services. The Florissant office is centrally located in north county and easy for anyone who lives or works in Florissant, Ferguson, Hazelwood, Jennings, Blackjack, Berkley, Spanish Lakes, Dellwood, or North St. Louis County, Missouri.